Google Forms allows you to create surveys and questionnaires that can be easily used for all types of data collection-- and AppSheet’s add-on works in conjunction with Google Forms to support extra features just for the mobile device (like signature and image capture). One powerful feature Google Forms offers is the ability to employ conditional logic, whereby users are directed to the next appropriate question based on the answer they chose on the previous one. AppSheet recently implemented this function as well, so any conditional logic a Form creator applies is also automatically respected in the resulting mobile app. Let’s take a look at how this feature might be useful. Say you’re running an animal rescue organization looking to match cats and dogs with possible new homes. You might want to send a survey to potential owners asking about their preferences so you can analyze the results and identify probable matches. 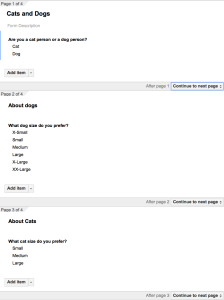 Your Form would first need to identify whether the person in question was looking for a dog or cat. Upon choosing “cat”, you certainly wouldn’t need that person to see any resulting questions relating to dogs. Here’s where conditional (or “branching”) logic comes in. First, you’ll need to create a new page or page break in your Form for each question that is a result of conditional formatting from a previous question-- this is how Google knows where to send the user. 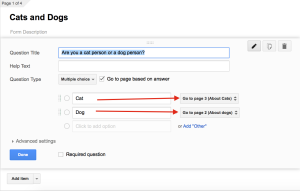 You have the option of naming your page break and adding a description, as seen in the "About dogs" and the "About cats" sections below. Since you've already created separate pages for the questions that are conditional, click the "Go to page based on answer" checkbox and then choose the pages respondents will be directed to based on their answers. That's it! When you include this feature in your Google forms, AppSheet will pick it up and your mobile app will respect the formatting. You don't need to use Google Forms to specify conditional branching-- you can also do it from within AppSheet's Advanced Editor (although this is much more complicated and not recommended!). You'd do this by choosing "Show" as the field type for the column in question, and then specifying the values in the TypeQualifier. Check out our tutorial documentation for more information about conditional branching.